An earthquake threat is building up in the central U.S.
Seismologists have found that, contrary to popular thought, earthquakes in the central U.S. are not slowly tapering off — instead the threat appears to be building. 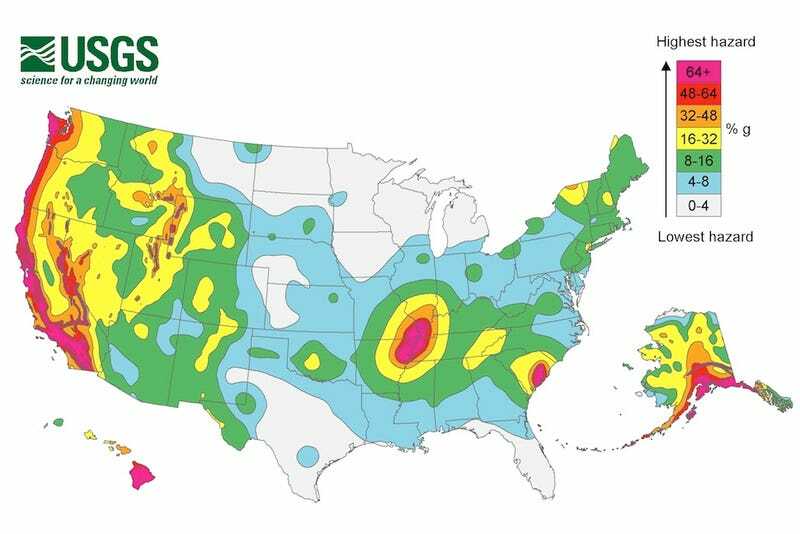 A new research study, published today in Science by USGS seismologists Morgan Page and Susan Hough, looks at earthquake activity in the New Madrid Seismic Zone (see the red dot hovering between the midwest and the south on the map above), which includes parts of Arkansas, Illinois, Indiana, Kentucky, Mississippi, Missouri, and Tennessee. Between 1811 - 1812, the zone experienced a series of four devastatingly powerful earthquakes in rapid succession. The continuation of smaller earthquakes along the site was theorized by many scientists to be lingering aftershocks from the nineteenth-century quakes. If that theory was correct, then the number of earthquakes should be continuing to slowly taper off. Instead, when they tested this theory against a computer simulated model of how aftershocks might be expected to work in the region, the researchers found that the number of earthquakes actually occurring was greater than the number of earthquakes expected. This means that stress along the zone is not decreasing, it is instead building, ramping up the earthquake threat level in the area.